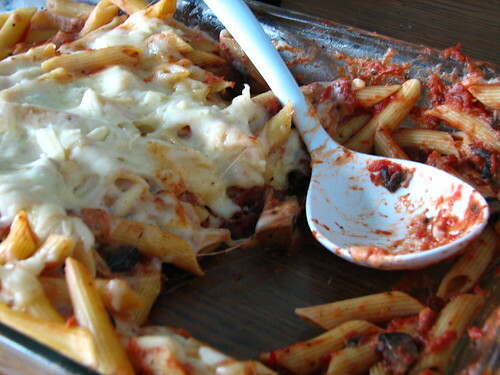 Our son and his wife made this delicious ziti for us one weekend when they were at our house. I decided to use this recipe for supper instead of the one I linked in my menu for the week. 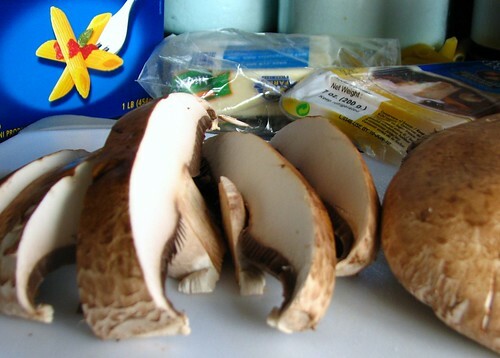 The recipe doesn’t call for mushrooms, but I had these lovely portobellos and decided to add them to the ziti. The recipe does call for shallots, but I left those out as DH is allergic to fresh onions. I like to grate my own cheese, so I used 8 oz. of Mozzarella, about 3 oz. of Parmigiana, and 4 oz. of Asiago. I cubed them, then ran them through the food processor. Grated cheese in less than 30 seconds. Wonderful! I grated them together, so they were all mixed. 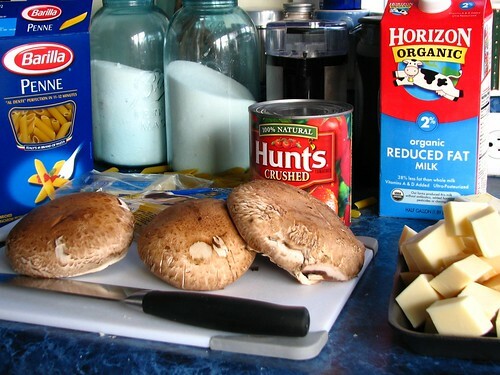 You can use three pans: 1 large for the red sauce, 1 large for the pasta, and 1 small for the white sauce, though I actually used two pans for cooking…a pot for cooking the pasta, and a pan for sauteing the mushrooms and garlic. After they were cooked, I added the crushed tomatoes and the seasonings, heated them through and then poured the sauce over the cooked pasta. After I scraped the pan clean with a spatula, I used it for the white sauce also (didn’t bother washing it). You also need a 9×13 casserole dish on hand on top of some hot pads. I greased it with cooking spray. Cook the pasta in boiling water. [I added a teaspoon of salt to the water. Optional.] Cook until al dente and drain. Return the pasta to the cooking pot. As the pasta cooks, grate the cheeses and set aside. 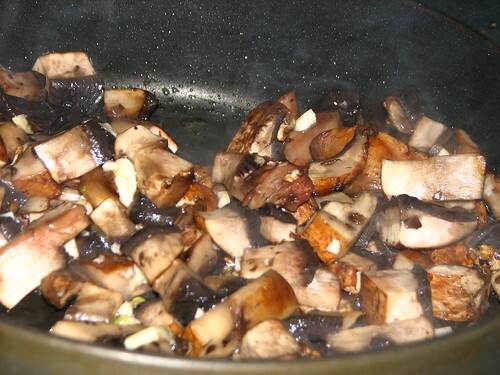 I sauteed the mushrooms until they were almost done, then added the garlic, so it wouldn’t cook too long. Add the crushed tomatoes. Add a palm full each of dried oregano and basil [I used about 2 teaspoons of each]. If using fresh basil, tear and add it right before pouring the sauce over the pasta. Also add a pinch of sugar to cut the acidity [I added more like a teaspoon of sugar]. Heat until bubbling, then reduce to a simmer. Stir occasionally. 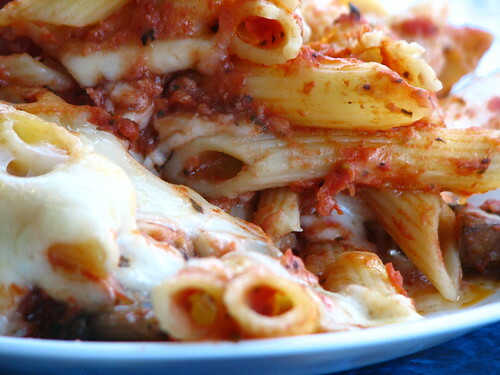 Pour the red sauce over the pasta in the cooking pot and stir to evenly coat the pasta. Pour the pasta into the greased casserole dish. 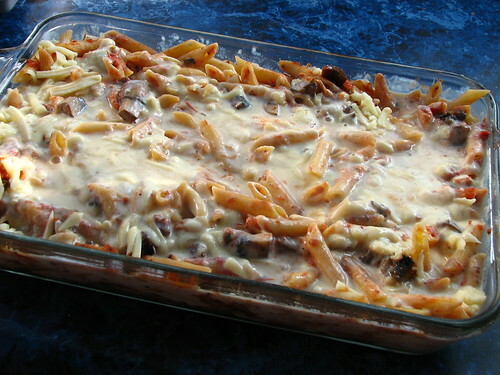 Top with half the grated cheese. Melt 2 T. of butter in a pan and make a roux with 2 T. of flour, whisking to combine. Let cook for a few minutes. 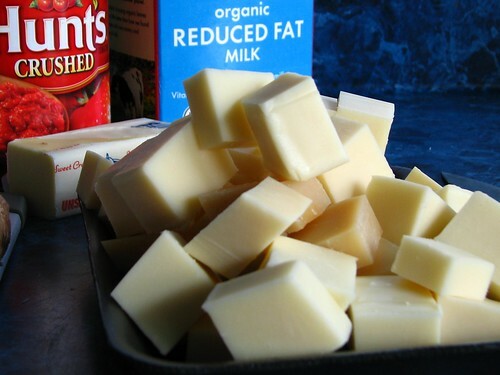 Pour in 2 cups of milk and grate in some nutmeg. Salt and pepper to taste. Whisk continuously while sauce thickens. Pour the white sauce over the first layer of grated cheese. 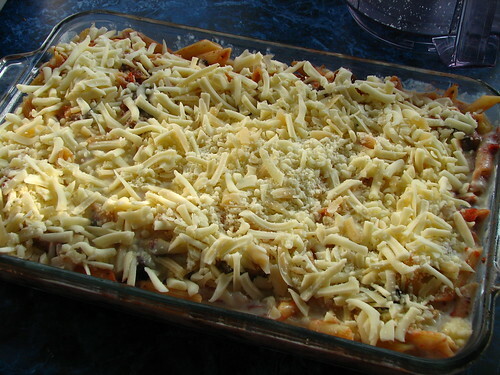 Add the second layer of grated cheese. Place in the oven and monitor until the cheese is melted and bubbly, 15-20 minutes. Don’t let it get too brown. Take out of the oven and let it sit for a few minutes before cutting into it. This pasta goes well with some crusty ciabatta or peasant bread to dip into olive oil and freshly ground black pepper. It also makes delicious leftovers. Just warm in the microwave and enjoy! I hope my DDIL doesn’t mind the minor changes I made to her recipe. I can’t seem to cook without doing that…The changes made the process easier for me. A delicious meal and one I would not hesitate to serve to guests. As a matter of fact, DH’s sister and her husband were visiting and they enjoyed it a great deal! 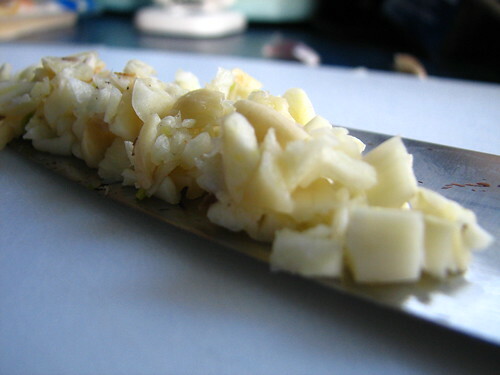 This entry was written by ~~Rhonda, posted on March 23, 2010 at 12:11 pm, filed under Recipes. Bookmark the permalink. Follow any comments here with the RSS feed for this post. Post a comment or leave a trackback: Trackback URL. My mom always added a little sugar to her tomato sauces- now I know why!